Savvy Spending: Kohl's: $10 off $50, extra 25% off, plus SURPRISE Kohl's Cash in store today with purchase! 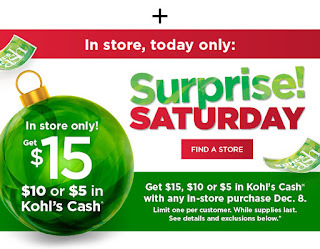 Kohl's: $10 off $50, extra 25% off, plus SURPRISE Kohl's Cash in store today with purchase! There is a new Kohl's Coupon you can use! Save an extra 25% off your order w/ promo code HOLIDAY25. Plus, save $10 off $50+ w/ promo code DEALS10. 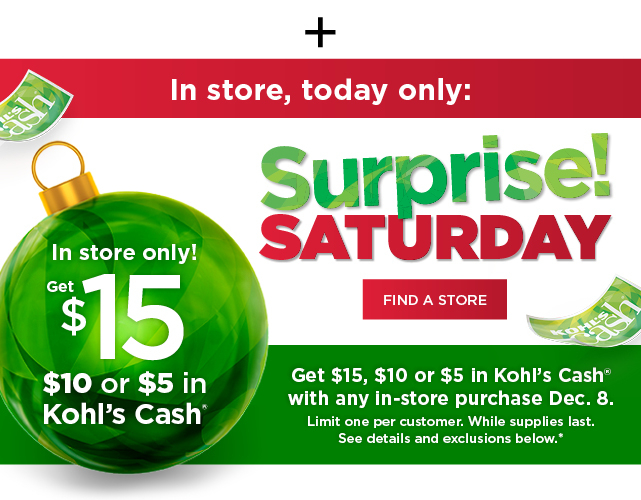 And, in store, TODAY only, you can get a SURPRISE Koh's Cash with any purchase- you could receive $5, $10, or even $15 Kohl's Cash! And you'll earn $10 Kohl's Cash for every $50 spent. If shopping online, start at Top Cash Back for an additional 1.5% cash back.